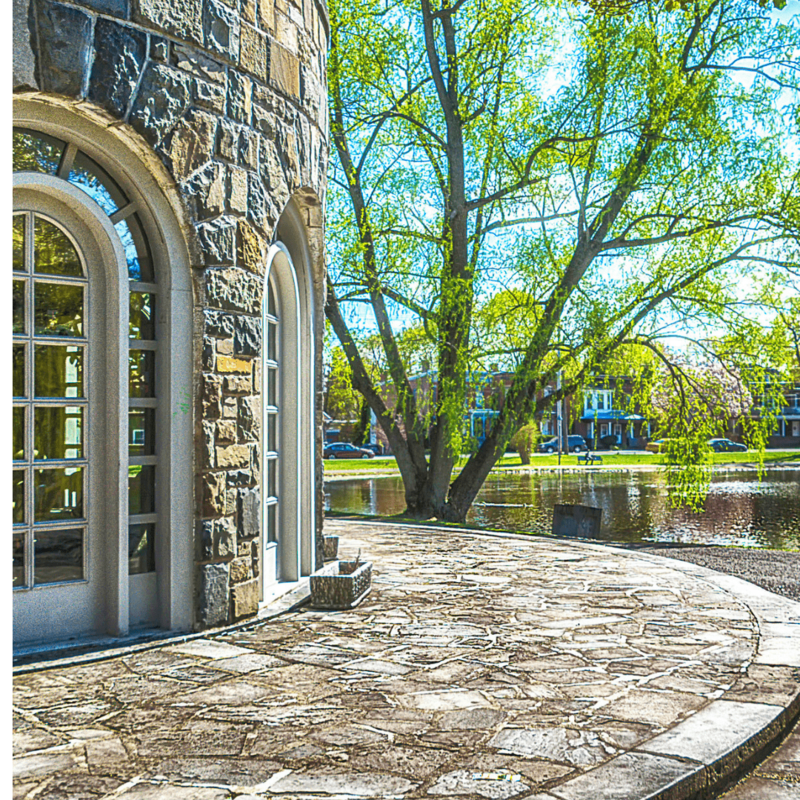 Since 1934 Downing Park’s distinctive round stone building has served as a wintertime shelter to generation after generation of Newburgh ice skaters. Though cold outside, inside skaters changed into or out of their skates and warmed themselves over steaming mugs of the hot cocoa that was available at the “Polly,” as the building adjacent to Polly Pond was known. In recent years the “Polly” stood vacant bearing a lonely testimony to a once vibrant city. That is, until this past June 2018, when the reincarnated “Polly” opened its doors as The Shelter House Cafe. Though many who pass by the beautiful park do not realize its illustrious history, in fact it was designed by two of America’s foremost 19th-century landscape architects, themselves superseded in prominence only by the park’s namesake, Andrew Jackson Downing. Frederick Law Olmstead and Calvert Vaux were commissioned by the City of Newburgh in 1889 to design the park in honor of their late mentor Andrew Jackson Downing. 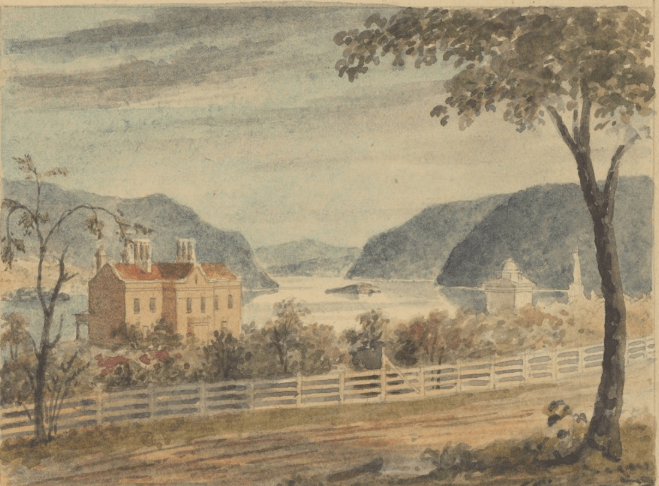 Downing born and raised in Newburgh had achieved great fame as one of the most distinctive style-makers of America’s 19th century influencing both landscape design and residential architecture, some of which can still be seen in Newburgh’s East End Historic District. However, Downing and 79 others perished horribly in 1852 in a fire on the ill-fated steamboat, the Henry Clay, which was racing from Kingston to New York. Boats in those days eclipsed by railroad travel, frequently raced for bragging rights, despite the danger it posed to the steam engine boiler rooms aboard the wooden ships. Downing was not quite 37, but had left an incredible mark and a huge void. Downing revolutionized designs for urban green spaces, advocating for large and beautifully conceptualized public spaces, aristocratic in scope but intended also for the masses. He was the genius behind the idea for New York City’s Central Park. In his absence, Downing’s protégés Olmstead and Vaux were commissioned to actually create Central Park, and they did, engineering a public masterpiece. These are all the hallmarks of Downing’s inspired approach to landscape architecture which his two students executed effortlessly. By the early 1930’s the Lions Club of Newburgh initiated plans for the construction of a shelter house. The resulting building featured expansive windows and a view of Polly Pond and joined the dramatic pergola designed by Frank Estabrook in 1908, as landmark structures in the park. Eventually, near the “Polly” an amphitheater that was designed to hold goldfish around it in a moat was built for outdoor concerts. Pollution and Newburgh’s declining financial fortunes took a toll on ice skating and care of the park structures. The Polly declined over the years, the shelter house – as well as the park’s other structures – became abandoned and neglected, and had completely fallen into disrepair by the time the Downing Park Planning Committee was founded in 1987. 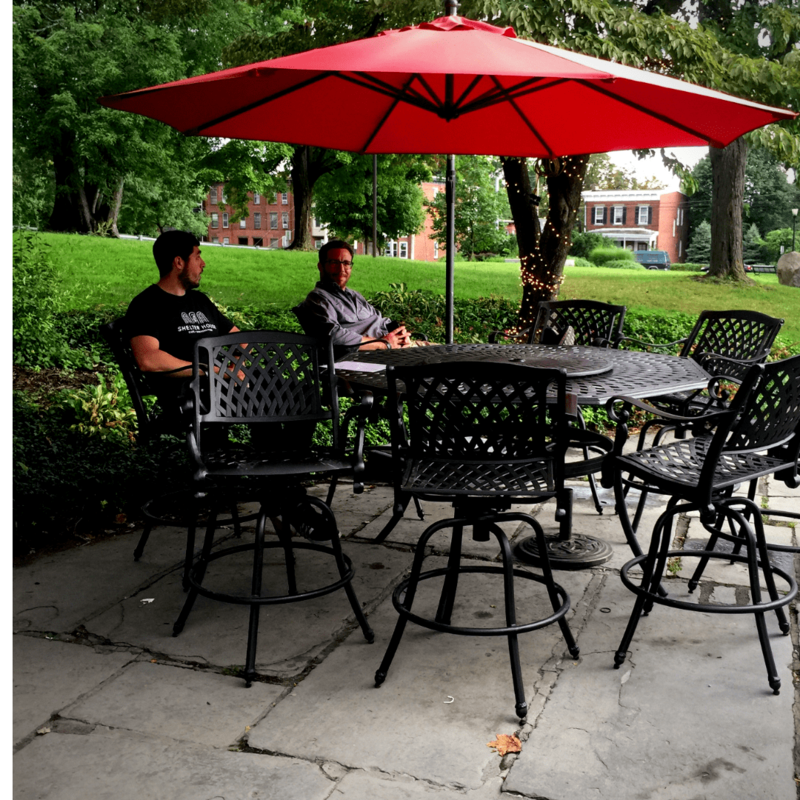 It was the Downing Park Planning Committee, the grassroots community group dedicated to working with the City of Newburgh to restore the park, that chose the Shelter House as their first revitalization project. The group raised over $300,000 in grants and contributions, which they used to dredge the pond, add new benches, redo sidewalks, and renovate the Shelter House, which they rebranded as a visitor’s center. The committee worked to develop programs that would draw the public back into the park, including a free fitness program featuring yoga and Zumba, as well as concerts at the amphitheater. Despite all their work, however, the shelter house building still wasn’t getting much use by the public until Downing Park volunteer Stephen Sinnott had the idea for a café, and the Shelter House Café project was born. Sinnott used his background in construction to design the layout of the café, building a countertop where baristas make coffee, putting in French doors, and adding other improvements to the space. Together with the help of numerous fellow Newburgh residents and business owners, Sinnott was able to create a unique space. Complete with fresh-ground espresso, delicious breakfast and lunch menu, and outdoor seating, it offers unbeatable views of the park. Officially opened in June 2018, the café interior features old photos and drawings of the park, as well as historic artifacts such as the finial from the roof of Andrew Jackson Downing’s home, Highland Garden. Downing’s home no longer exists. Today the Shelter House still acts as the park’s visitor center, but now visitors to Newburgh and locals alike can enjoy a caffeinated beverage along with meals named after the designers of the park and nearby Newburgh streets, such as the Olmstead and Vaux breakfast sandwiches, or the Carpenter Ave pulled pork sandwich. Sinnott hopes that this winter the ice will freeze deep enough to allow ice skating on the Polly again. Per tradition, the Shelter House Café will offer hot chocolate in addition to its assortment of teas and coffees. While the committee has much to celebrate in the success of the renovated space, the Shelter House is just the beginning of the planning committee’s restoration of the park. “One of the things that we requested was that the proceeds to the concession stay within the park to help fund other public events, such as the fitness program that we implemented, plays on the amphitheater, maintenance and restoration of the park’s landmarks,” explained Sinnott. The Downing Park Planning Committee next plans focus on restoring other features in the park, such as the pergola and amphitheater. For Sinnott and the committee, the hope is to return the park to the gem it once was. Towards that end, the Downing Park Planning Committee just closed on a DASNY Grant to replace the civil war monument. Remaining money will be used to restore some lighting around the park. The Shelter House Café is open six days a week: Tuesday through Thursday 9:00 am- 5:00 pm, and Friday through Sunday 9:00 am – 7:00 pm. It’s a great place to eat outdoors while admiring the park. The space is available to be booked for private events and catering. Visit the Shelter House website for details. This fall The Shelter House Cafe will launch a weekend music series featuring local musicians during Sunday brunch and occasional Saturday evenings.